We serve this at Bumpkin—it is Juliet's favourite drink, and as I always like to have my friends' favourite drinks on tap, I make sure to have all the ingredients at home too when entertaining. 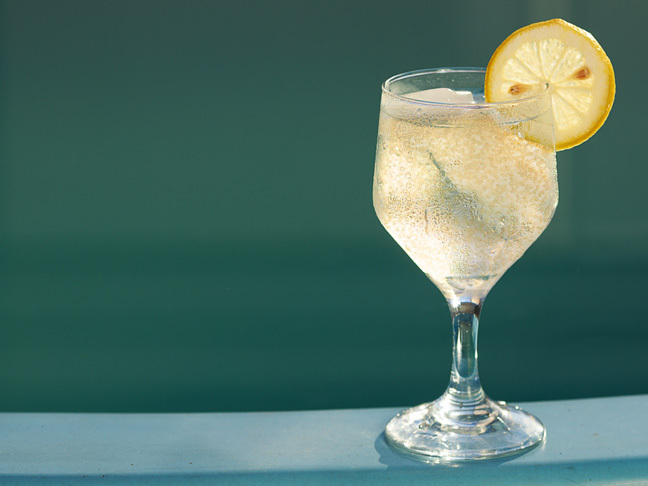 This white wine spritzer is incredibly refreshing, AND as it is one third sparkling water, it is a slow burn and won't have you in the gutter after a couple glasses. The definition of refreshing - helllllooo, weekend! Step 1: Fill your wine glass almost to the top with ice. Step 2: Pour in the wine and club soda or sparkling water, making sure to use the two parts to one part ratio as noted above. My preference is to use Kim Crawford Sauvignon Blanc (it's an Australian wine & my favourite). But if you live in the US and can't get this wine, any Sauvignon Blanc will do. Step 3: Twist your sliver of lemon rind over the glass and then drop into the drink.